Samuel Gruber's Jewish Art & Monuments: Poland: Krakow's Beit Midrash Hevra Tehilim. How Should The Wall Paintings Be Presented? Krakow, Poland. Beit Midrash Hevra Tehilim. Interior being prepared for nightclub. Photo: Samuel D. Gruber, May 2013. I've been working lately on the history, art, and preservation of the 1910 mural from the Chai Adam Synagogue in Burlington, Vermont. 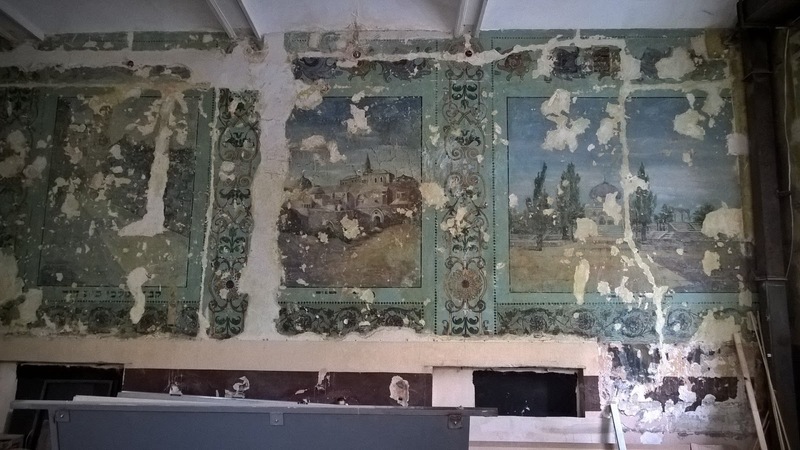 This has led me to look deeper at other fragments of late 19th and early 20th-century synagogue wall painting; mostly re-discovered in recent years. 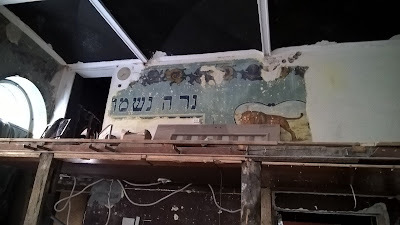 When I was last in Krakow, Poland, in 2013, I saw for about 20 minutes the remarkable paintings in the former Hevra Tehilim (Psalm Brotherhood) prayer house at 18 Meiselsa Street (and 13 Bożego Ciała St) in the Jewish quarter of Kazimierz. 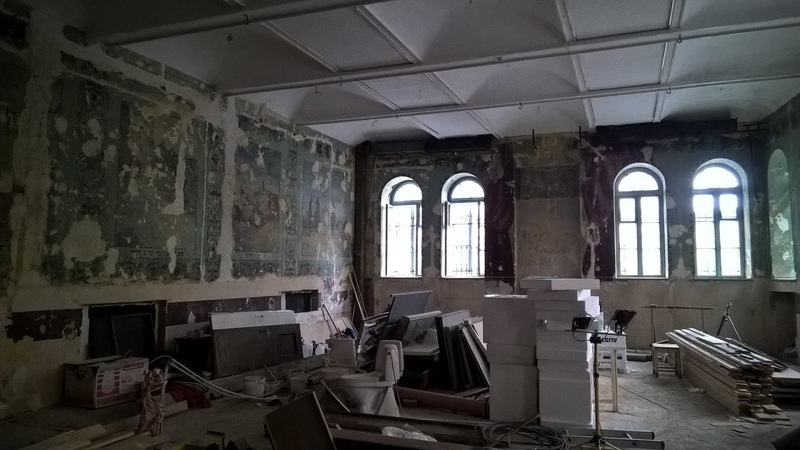 This largely intact cycle of wall paintings, painted some time between 1896 and the early 1930s, was entirely unknown to scholars and the public just a few years earlier. The large ground floor prayer hall was inaccessible to the public, and when returned to the Jewish community was still undistinguished, since all the decoration remained hidden by later coats of paint. Based on my brief visit and a series of photos taken of the mural in 2008 by Slawomir Pastuszka and shared on Wikimedia, I want to make these works better known, and to stimulate discussion about their history, iconography and future preservation. More photos by Vladimir Levin, taken at the same time as my visit, have been posted by the Center for Jewish Art. Please contribute any information on the background of the paintings, or your ideas about their long term protection and presentation. Krakow, Poland. Beit Midrash Hevra Tehilim. Interior being prepared (again) for nightclub or restaurant. Photo:Tomasz Cebulski 2016. Krakow, Poland. Beit Midrash Hevra Tehilim. Photo: Sławomir Pastuszka 2008. At the time of my visit, the space was being "renovated" for use as the "Mezkal" nightclub. Now, the nightclub has closed, and according to a report by Tomasz Cebulski earlier this year, new "renovations" are taking place for another tenant - perhaps a club or cafeteria. In the 1990s, when I was investigating still extant former synagogues in Krakow, this building, while known, was not considered especially noteworthy. Maria and Kazimierz Piechotka had taught us about the magnificence of lost wooden synagogues, but there was not yet an available typology for masonry synagogues. The Piechotka's own work on 19th-century synagogues was not yet published, nor had Eleonora Bergman yet taught us the importance - and former ubiquity - of the hundreds (or thousands) or seemingly unimpressive buildings and spaces that once housed prayer and study rooms - especially in the late 19th and early 20th centuries. Today, we have only a small number of these spaces that recall in any way their former use. Of these, the former Hewra Thilim building is probably the best. Krakow, Poland. Former Hevra Thilim prayer house (first floor), 18 Meiselsa Street (and 13 Bożego Ciała St). Photo: Samuel D. Gruber 2013. In the post-war years the building housed the seat of the “Krakowiacy” Singing and Dancing Group (Zespół Pieśni i Tańca “Krakowiacy"), and only in 2001, under the 1997 law on restitution of Jewish property, was the synagogue returned to the Jewish Community of Kraków. At the time, the Community allowed the music group to remain, provided that it undertook repairs of the building. The group carried out renovation of the interior in stages with funds from the the city of Kraków. According to a report about the building by Miłosz Gudra on Virtual Sztetl, "The management board stated that it could not afford new windows and a thorough renovation of the roof; the city, on the other hand, refused to allocate money in this case because it was not the owner of the synagogue. The group ceased to occupy the building in 2006." Then, in 2008, the brightly colored synagogue wall paintings were discovered. The images include vivid depictions a lion, a tiger, eagle (fragment) and a deer in ornamental frames on the west wall, at the women’s gallery level. These illustrate the favorite passage from the Mishnah, "Be as strong as a leopard, as light as an eagle, as swift as a deer, as brave as a lion to do the will of your Father in heaven" (Pirke Avot 5:23). In these paintings, which seem to be copied from a nature calendar, the leopard has become a tiger and the swift deer is a stately buck. A recess for the Aron ha-Kodesh with surrounding fragments of a painted red curtain has been preserved on the east wall. The decorative program also preserved a Hebrew memorial inscription reading “A candle of soul,” and expansive floral motif decorations. Just below the ceiling is a floral frieze. The windows are surrounded with painted red flowers, and there is a vertical floral frieze set between pairs of windows. A fragment of a view of Jerusalem is preserved near a platform in the rear - that may have been reserved for women, though it is hard to tell if this is original. On both the north and south walls are two series of empty square niches. Krakow, Poland. Beit Midrash Hevra Tehilim. Painted curtains around Ark niche. Photo: Sławomir Pastuszka 2008. Krakow, Poland. Beit Midrash Hevra Tehilim. Interior east and south walls. Photo: Samuel D. Gruber, May 2013. Krakow, Poland. Beit Midrash Hevra Tehilim. Interior wall painting. . Hebrew: נר נשמה , ner neshama, meaning "soul candle". Photo: Tomasz Cebulski 2016. On the north wall, set within painted ornamental floral frames, are four pictures of holy sites - real or imagined. Other than an extremely damaged picture of the Western Wall of the Temple Mount (Hebrew: "Kotel,") these differ from more common scenes. There is a view of the Tower of David ("Migdal David"), and another of ruins that is labeled (fragmentary inscription) "Tombs of the Kings of the House of David". Lastly, there is a view of a pavilion-like domed building flanked by cypress trees. I can't decipher the fragmentary inscription. Is this also a tomb? Or is it meant to be the rebuilt Temple - modeled loosely, as was often the case, on the Dome of the Rock? If the Temple, it suggests a messianic theme, stretching from the ruined Temple, through the House of David, to Messianic times. Krakow, Poland. Beit Midrash Hevra Tehilim. Image of the מגדל דוד Migdal David (Tower of David). Photo: Sławomir Pastuszka 2008. Krakow, Poland. Beit Midrash Hevra Tehilim. In 2013, the inscriptions had bee covered over by protective (?) panels. Photo: Samuel Gruber 2013. Krakow, Poland. Beit Midrash Hevra Tehilim. Fragment of view of Jerusalem. Photo: Sławomir Pastuszka 2008. As Tomasz Cebulski notes in his post, there is no reason the space of this former prayer house should not be used, and even used to bring income to the Jewish Community. But given its history and extant art, the adaptive reuse should be "with respect, care and adding new meaning and understanding to this important historical space." There should a better long term solution. While this may never be a synagogue again since the Community has already invested in the restoration or refurbishment of several other historic prayer spaces, it could and should serve some other purpose that would allow the murals to be viewed unobstructed on a regular schedule, and the space used in a low-impact, dignified manner. The room is ideal for performance, lectures, meetings, exhibits and related activities.